This calculator works with metric numbers if you enter the Tire Diameter in metric. Tire Diameter is used instead of Tire Radius because Tire Diameter automatically compensates for toe at the leading and trailing edge of the tires. 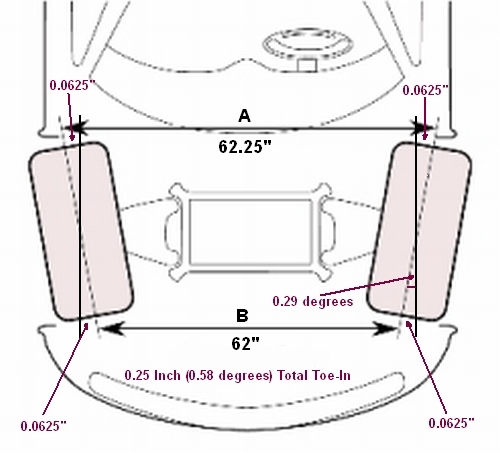 The Honda AP1 S2000 Shop Manual calls for 0.25 inch of total toe-in at the rear wheels. Toe-in in inches is the difference between measurements A and B in the diagram below. Shop Manual toe-in in inches is measured on the tire tread at the axle level. 0.0625" measured at leading tread of the right tire + 0.0625" measured at trailing tread of the right tire. 0.0625" x 4 = 0.25". When measuring toe in degrees you do not need to double the measurement for the leading and trailing edge of the tires as you do when using inches. If one rear wheel measures 0.29º of toe-in and the other measures 0.29º, then total rear toe-in is 0.58º, not 1.16º. AP1: 0.25 inch (1/4" or 6mm) of total rear toe-in is equal to 0.58º (decimal degrees) of total toe-in. AP2: 0.14 inch (3.7mm) of total rear toe-in is equal to 0.33º (decimal degrees) of total toe-in. If you use string to measure toe and use the wheel rim for measurements your numbers will not match up with the Shop Manual because Shop Manual toe is measured at the tire tread. You can get pretty close by decreasing the tire tread measurement by 25% to approximate the correct rim measurement. For more info on aligning the S2000 see the Alignment and Corner Balance pages.